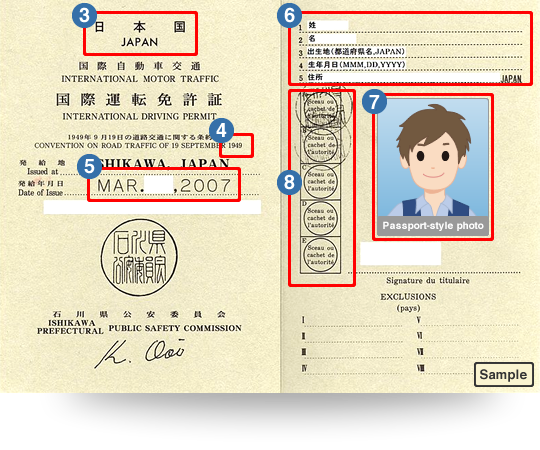 Drivers who hold a foreign driving license must have one of the following in order to drive in Japan: 1) An international driving permit; 2) A valid foreign driver's license AND a Japanese translation of that license (applicable countries and regions only). This document is issued by signatory countries in a format determined by the Geneva Convention on Road Traffic. International driving permits issued according to the Paris Convention (1926), Washington Convention (1943) and Vienna Convention (1968) DO NOT permit holders to drive in Japan. Drivers from the seven countries and one region below are permitted to drive in Japan if they hold: a) their passport, and b) their domestic driver's license and a Japanese translation. The Japanese translation is only valid if issued by the relevant embassy or consulate in Japan, or by the Japan Automobile Federation. In Taiwan the translation must be issued by the Japan Automobile Federation or the East Asia Relations Commission ＊. 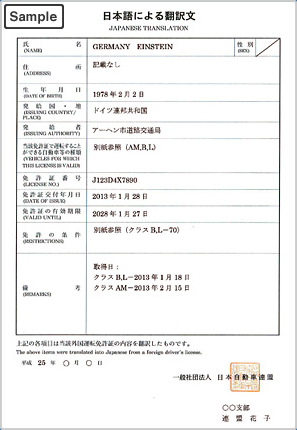 According to Article 39-5, paragraph (1), item (2)ﾊof the Order for Enforcement of the Road Traffic Act, the East Asia Relations Commission (including branches and offices) is considered a valid organization by the National Public Safety Commission for the purposes of issuing a Japanese translation. Please take sufficient care regarding the type of license and the period of validity. If drivers are unsure of the rules, they should contact their local driving license issuing authority. International driving permits issued by countries and regions that have not ratified the Geneva Convention. International driving permits issued by countries and regions that have ratified the Geneva Convention, but that issue international driving permits in a format according to the Vienna Convention. International driving permits issued by authorized bodies in countries and regions that have ratified the Geneva Convention, but when the form of the permit is very different. International driving permits issued by bodies that are not authorized to do so. In the United States, only the AAA and AATA are authorized to issue international driving permits.